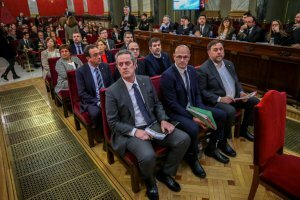 The trial of pro-independence leaders in the Spanish Supreme Court is ‘shameful,’ ‘painful’ and ‘outrageous’ according to several political leaders, speaking to the press at the doors of the court. 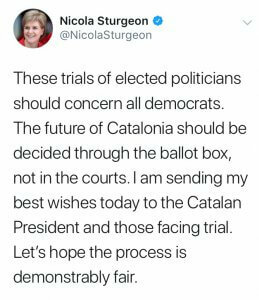 Some MEPs have also called it a ‘political trial’. ‘Despite the pain we feel, we will see a lot of dignity on the courtroom benches. All they did was provide ballot boxes. We’ll see how shameful the Spanish state is, it’s scared of democracy, it’s persecuting peaceful people that only allowed citizens to decide their own future,’ said the current Catalan parliament speaker, Roger Torrent. ‘This is a political case, not a criminal one. It’s a political trial against political ideas. If there is a sentence against our colleagues we will keep standing in favor of Catalan independence and a referendum,’ said the Catalan vice president Pere Aragonès in comments to the ACN news agency. The mayor of Barcelona, Ada Colau, described the trial as a ‘failure of politics’. According to her, the ‘only way’ to solve the situation is for all the prisoners to be ‘released’ and to start ‘dialogue and negotiations’. Colau said that there is a ‘majority’ in Catalonia against the trial and described it as a ‘sad day’ for Spain. ‘What is at stake is democracy,’ said the Barcelona city councilor, Jaume Asens. ‘It’s outrageous and shameful,’ he added, describing the trial as an ‘act of vengeance’ against political leaders. The spokesman for JxCat, the party of former leader Carles Puigdemont, said the trial is against “every Catalan”. “This is a trial against ballot boxes. We are all sitting at the bench for the accused,” said MP Eduard Pujol. Meanwhile, pro-independencefar-left CUP Vidal Aragonès said that the trial should be won politically. ‘We need the people to get organised and to mobilize,’ he said in comments to the press from the doors of the Supreme Court. He expressed his solidarity with the defendants, and warned that the process will not be fair and is a mere ‘formality” to condemn them. Former president of the Catalan National Assembly and currently and MP, Jordi Sànchez, is one of the accused in the trial and faces up to 18 years in prison. The president of Òmnium, Jordi Cuixart, is also one of the defendants, facing also 18 years in jail. Mauri asked citizens to protests against the trial, and defended Catalans right to self-determination. From the Spanish left-wing Podemos party, spokeswoman in the Congress, Ione Belarra, said the trial ‘should never have happened’. ‘It’s the result of a suicidal strategy by the People’s Party (PP),’ she said, adding that the former Spanish government had contributed to ‘inflating’ the political conflict by sending it to the courts instead of finding a negotiated and political solution. Madrid’s left-wing platform, the Coordinadora 25S, showed its support for the political leaders, with the platform’s spokeswoman, Elena Martínez, saying the trial was judging ‘democracy and the Spanish state,’ which Martínez said ‘only had repressive solutions’. Meanwhile, the EU-Catalonia Dialogue Platform in the European Parliament has announced that it will be ‘following closely’ the trial against the 12 Catalan leaders. In a press conference in the European Parliament in Strasbourg, the group spokesman, Ivo Vajgl, said that they will travel to Madrid to ‘personally’ see the proceedings. ‘We reject the false narrative behind the accusations, and denounce that this is a political trial,’ Vajgl insisted. Italian MEP Eleonora Forenza, explained that they have requested to be ‘observers’ and described the trial as a ‘European issue’. ‘We are seeing a political trial in 2019 Europe,’ she said. Another member of the platform, French MEP José Bové, added that ‘the process is not fair, and should not be happening.” “Dialogue is needed, and also a change of the Spanish Constitution,” he said. The daughter of one of the fathers of the European project, Barbara Spinelli, described as ‘outrageous’ to have ‘political prisoners in the EU’. ‘If this was happening in South America or the Middle East, with elected representatives in a show trial for simply allowing citizens the opportunity to decide their future, the condemnation of EU leaders would be deafening,’ said Irish MEP Matt Carthy. According to him, the current ‘silence’ of the European institutions ‘is shameful’. “The EU needs to help Madrid to come out of this stupid corner in which they painted themselves,” said Estonian MP Indrek Tarand.